From simply cleaning dirt and grime off walls or the driveway to taking care of big industrial clean-up jobs, KVM’s line of high quality pressure washers has you covered. 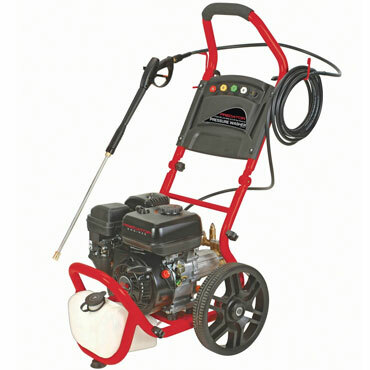 With high-pressure hoses and convenient portability, our pressure washers deliver plenty of mud-busting power. Our lightweight 1650 PSI Pressure Washer easily handles light duty tasks such as washing vehicles and equipment while the behemoth 2500 PSI, 3 GPM, 6.5 HP Pressure Washer tackles the toughest cleaning jobs around. At KVM, you’ll find the powerful, no-nonsense tools you need to get the job done right without breaking the bank.